One of the key challenges that we hear when we talk to PRODUCT Managers is that they are often expected to perform the role of PROJECT Manager for some or all of the delivery of their product to the marketplace. “I know that Product Managers are often asked to be Project Managers. Are Project Managers often asked to be Product Managers?”. This generated a lot of reactions, mostly questioning whether one person can effectively fulfil both roles at the same time. At Brainmates we treat these two roles as fundamentally different, yet interrelated roles. As a reaction to this discussion we wanted to elaborate more on the interaction of these roles and sat down with Damian Haslam, Project Manager at Vodafone. The first challenge in differentiating the role of Project Manager or a Product Manager is that they sound a lot alike. While it is a trivial semantic issue it often leads to confusion about the 2 roles. It’s important to begin with the definition of the words Product and Project. PROJECT: A project is a temporary endeavour undertaken to create a unique product, service, or result . PRODUCT: A product is anything that can be offered to a market that might satisfy a want or a need . A product has a life cycle. It’s conceived, developed, introduced and managed in the market, and retired when the need for a product diminishes. A product developed within context of a project is needed to create a product. During the life cycle of a product sometimes multiple projects can occur. As a result of these definitions we can see that a Project Manager’s focus is internal and tactical whereas a Product Manger’s focus is external on the customers’ need and on the resulting product strategy. A Project Manager is ultimately responsible for a predefined outcome which will be described as the projects objective. They will manage the development of the product, service or result through the application of available resources (including a project team). Risk and issue management is an important aspect of Project Management and serves to highlight and then manage any risks to the project completing successfully, as well as minimising the impact of any issues that are identified. Scope management is usually the most difficult activity a Project Manager is involved in and involves limiting the extent (scope) of the endeavour within acceptable allowances, usually engaging in a balancing act between the three critical aspects of time, cost and quality. For instance, if the time to deliver the project is reduced then either cost must be increased, or scope reduced to maintain quality. Project management is a tactical, time limited activity that is defined by the businesses strategic objectives. Working with sales, marketing and support to ensure revenue and customer satisfaction goals are met. The Product Manager’s job also includes ensuring that the product and marketing efforts support the company’s overall strategy and goals. A Product Manager tries to find out the customers’ needs and develop a product to satisfy them. Product Management DEFINES the strategic business objectives that initiate discrete projects. It’s evident that the roles of a Project Manager and a Product Manager are very different but these roles have a similar skill set. So it is not uncommon for organisations to ask Product Managers to take on Project Management responsibility and vice versa. If a Product Manager is also running a project his/her time and attention for the customer strategy gets diverted to chasing people, reporting etc. You do not have the sufficient skill set to perform well on all points. A Project Manager excels at managing to datelines and a Product Manager knows what the customer wants and keeps that in mind. Wearing both hats with different objectives sometimes results in a conflict of interest. How Can We Manage These Problems? Brainmates has developed a simple tool to identify if you are doing the job of a Product Manager or a Project Manager. The tool contains a set of questions and a results presentation grid. The grid provides a visual overview to help you determine if you are doing the job of a Product Manager or Project Manager. Your questionnaire scores will determine the colours displayed on the presentation grid. for example, if an activity displays the colour PINK it means that you are doing a task that is not part of the core focus of your role. In the example below the Product Manager has been doing a couple of the Project Manager’s tasks. 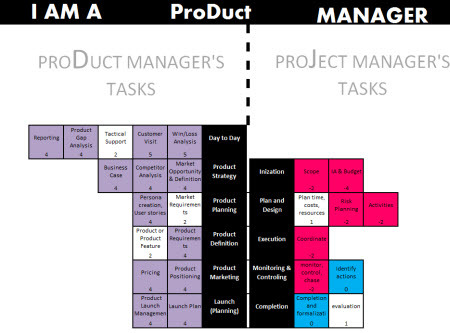 The Product Manager’s tasks are shown on the left side of the grid. The right side of the grid shows the Project Mangers tasks. On the grid below a couple of tasks are coloured PINK. This indicates that the Product Manager has fulfilled tasks that he/she ideally should not be doing. We can also see that some Product Managers tasks are PURPLE. This indicates that the Product Manager is not able to complete his/her own required tasks. The tool can be downloaded here and we would love to get your feedback and ideas on how to improve it. It is not a question of one or the other. Both the Product Manager and the Project Manager roles are required for long term business success. Project Management Institute (2004). A Guide to the Project Management Body of Knowledge: PMBOK Guide. 3rd Edition. Newtown Square, Pennsylvania, Project Management Institute, p. 5. Kotler, P., Armstrong, G., Brown, L., and Adam, S. (2006) Marketing, 7th Ed. Pearson Education Australia/Prentice Hall.